We can handle the imaginary terror of UFOs and nightmarish, flying mammals. But, robots that can jump like a human and then glide like a colugo? Now you're just filling Mr. Spielberg with even more sci-fi, end of days fodder. 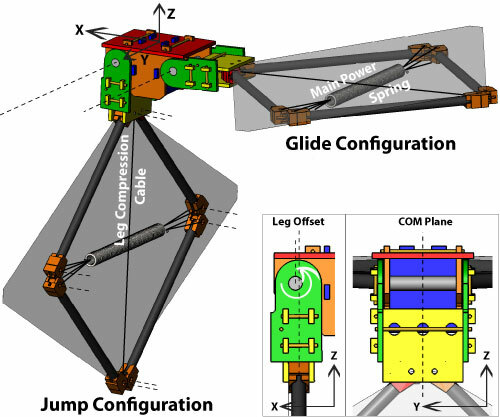 Carnegie Mellon researchers Matthew Woodward and Metin Sitti have crafted a prototype jumping and gliding bot at the university's NanoRobotics Lab that springs into action using a pair of human knee-like joints. The automated hi-jinks don't end there either, as the duo's invention then spreads its legs to catch some air and glide on back to terra firma. The project isn't just some bit of engineering whimsy; the team plans to adapt this tech for use in "unstructured terrain" -- i.e. non-level, wargadget territory. For now, this lord of the leaping gliders can reach comfortable human-sized heights of up to six feet. Give it some time, however, and we're sure this lil' android'll give Superman a bound for his money. Tags: Carnegie Mellon, Carnegie Mellon University, CarnegieMellon, CarnegieMellonUniversity, gliding, jumping, Matthew Woodward, MatthewWoodward, Metin Sitti, MetinSitti, NanoRobotics Lab, NanoroboticsLab, research, robot, robotics, video, technomatic, tech.currentblips.